We all wish that every day outdoors could be filled with good weather and sunshine. Unfortunately, as everyone knows, that isn't always the case. When the weather outside is a little bit frightful, though, you can take matters into your own hands using this King Canopy Rain Gutter for Use Between Two Canopies. You can this rain gutter setup to connect two King Canopy 10 ft. instant canopies using the included ball straps for a secure connection. You're not connecting the frames, mind you, you just attach this gutter quickly and simply between the two canopy tops (situated next to each other, of course) to create a completely covered area that comprises both canopies and the gutter-protected area. The poly tarp material gutter diverts rainwater in the area between the canopies, so you essentially end up with double the covered area with a handy gutter system in the middle. Many owners find that this allows them maximum flexibility outdoors. When the weather is nice, they can arrange their canopy or canopies wherever they please. When rain sets in, though, they can connect two of their own canopies or hook up their shelter with a friend's to create a comfortable, dry environment for everyone to enjoy. If you spend enough time outdoors, you're going to run into some inclement weather at one point or another. It doesn't have to be a disaster, though, and it doesn't necessarily need to even be that inconvenient. 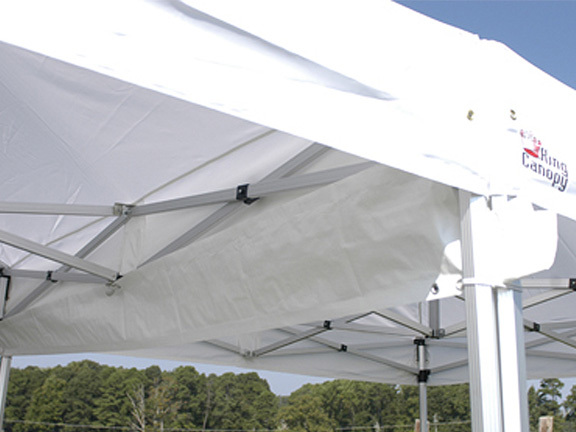 Being as unpredictable as it is, the weather may dictate from time to time that you use a King Canopy Rain Gutter for Use Between Two Canopies to keep your friends or family dry and having fun when bad weather threatens. Will this gutter work for my EZ-Up 10 x 10 canopy? What gutter will? 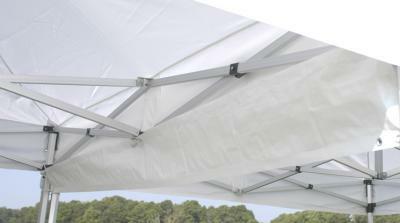 If you are purchasing a EZ-Up brand tent, we do not carry a gutter for that brand. We carry gutters for Vitabri, King Canopy, Caravan, and Eureka products.